It’s clear I love overalls. I own four pairs and have been tempted to purchase more. They’re fun and look funky and artsy. They don’t care if you ate a whole burrito from Chipotle and are way more comfy, especially when sitting and on humid days, than a pair of jeans. I loved overalls back in the ‘90s and this is one trend I have chosen to revisit. However, styling overalls can be tricky. Wrong choice and you look like a farmer, a toddler, a Blues Traveler groupie from 1994, or just a sloppy mess. My tips on how to style overalls. Overalls, even if a slim style, are bulky and there isn’t a waistband to cinch your figure in the middle. Choosing a fitted top will balance the volume of the overalls while also fitting with current trends. I will wear a tighter top with overalls than I would with a pair of jeans, since most of it is covered. Bodysuits, fitted tees, tank tops, fitted turtlenecks… all of these are safe bets with overalls. When you think about it, the only parts of a top that are seen with overalls are the sleeves and the neck and chest. A graphic on a tee will be mostly hidden, and so will part of a v-neck or other lower neckline. Having the design or design element partially obscured won’t be the most stylish option and will confuse the eye. Look for necklines that end above the bib/top of the overalls and doesn’t disappear under the straps. For prints, choose an all-over one, or my preference is to go with a solid since overalls are a lot of a look on their own. As for sleeves, since they will be a focus choose a length that you like the best with your body shape. 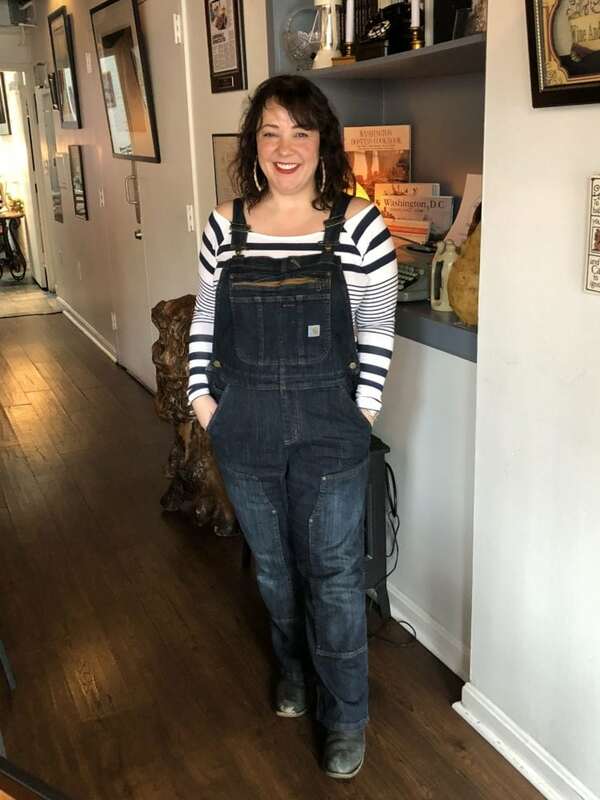 While I am not one to be focused 100% on figure flattery, overalls can create optical illusions and you may want to choose a sleeve length that doesn’t emphasize those illusions. Where a sleeve ends will make that part of the body bigger; a sleeve that ends at the bust line or the belly may make that part of the body seem larger or emphasized. I like the look of overalls with a sleeveless top or tank because the bulk of the denim and the hardware seem to make my arms look smaller. While overalls may seem heavy, I love them in summer because they are breezy and look great with smaller tops. In college, I went to a Halloween party as a Safety Patrol. Cleaning out my childhood home I found my orange patrol belt. That with my overalls, a striped t-shirt and two pigtails and I looked like a kid. That was perfect for Halloween, but if you’re reading this post I doubt you’re desiring a juvenile look for your overalls. Yes, you can wear stripes with overalls but you need to be choosy. Thin stripes with wide space between them feels more adult than evenly spaced stripes. Consider more muted tones – white with black, ivory with navy, gray with black, khaki with black. This way, the stripes feel adult. Also look for silhouettes that don’t feel childish; a crewneck t-shirt is what a toddler could also wear while a tank, long-sleeved bodysuit, or tissue-weight fitted turtleneck is not. Overalls can feel very utilitarian, rough, and casual. Balance that roughness with a ruffled blouse, a chiffon t-shirt, something with lace. The combination can be quite chic. Just be sure that the blouse is well tailored and somehow secured at the bottom so it doesn’t blouse out on the sides. 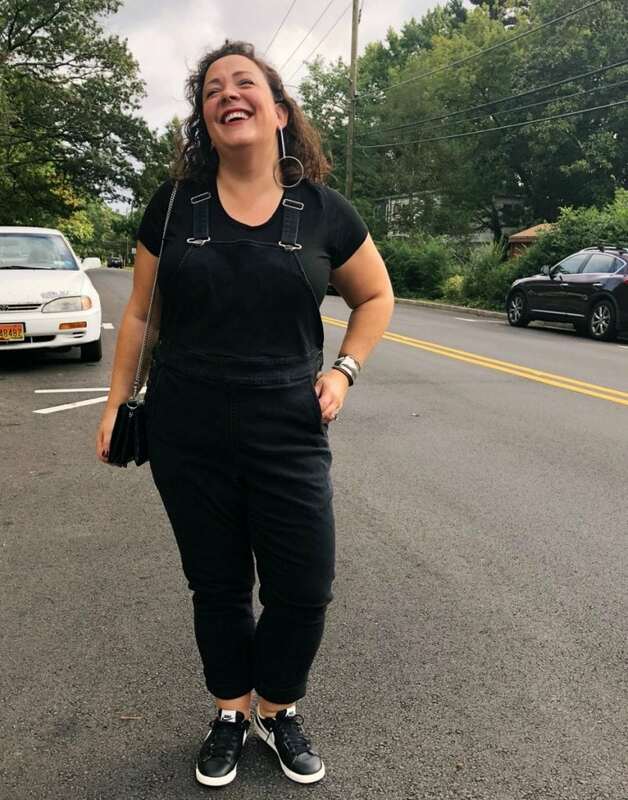 Bodysuits are great, depending on the height of the sides of your overalls you can tuck your blouse into your underwear to achieve the same effect. These days overalls come with wide legs, straight legs, and skinny legs. They’re cropped, they’re slouchy, they’re cuffed, they’re cutoff. Since there is no specific cut of overalls, there is no specific shoe to wear with them. However, as mentioned above with tops, you need to consider volume and balance. When wearing more traditionally cut overalls, you want to make sure your foot is visible. A low-profile sneaker, slim bootie, or flat can disappear under the overalls distorting your figure. A platform or chunky sneaker or a more solid boot (engineer, hiking, construction, Doc Martens, etc.) are great choices. For spring and summer, such shoes may seem too heavy. A canvas sneaker with a thick sole, a clog, or even a platform espadrille could work, depending on the color and fabrication of the overalls. My favorite choice is to cuff the overalls a bit so the top of the foot and a hint of ankle is showing and pair with a chunky sandal. My favorite are Birkenstocks which are comfortable and supportive while still being on trend. I love my silver pair which adds shine and interest, but I also love the EVA version which is waterproof, washable, and a lower price. As for the cuff, do what feels right for you as there are no style rules around this. I have seen a very wide single cuff, a 1-2”double cuff, and even a tapered roll or “French” cuff. 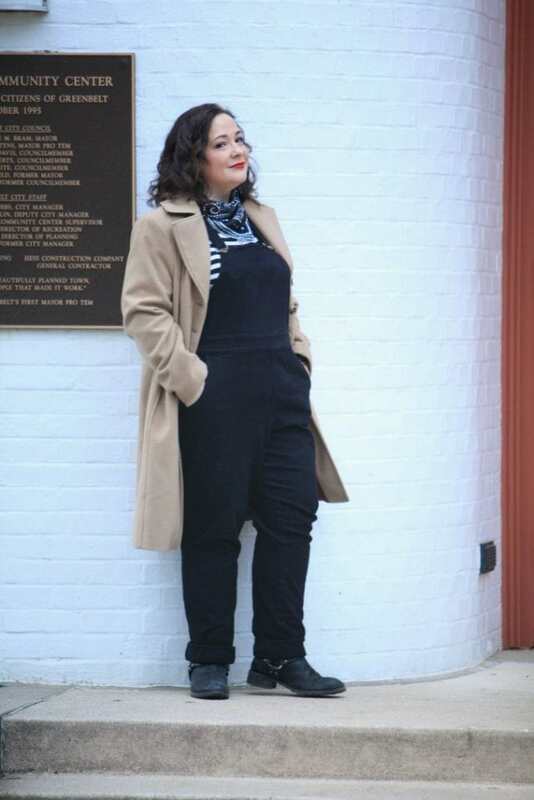 With cropped straight or wide-leg overalls, use the same guidelines I provide for cuffing your overalls. Something with a bit of substance to balance the volume. With slim overalls, you can carry off a slimmer shoe. I still wouldn’t recommend a ballet flat, but a lower profile sneaker or sandal can look great with slimmer overalls. This is a great time to rock your trendy sneakers! “French” cuff the bottom of your overalls and pair with a stiletto boot or pump. On top, wear a feminine blouse, a simple bandeau, or even a cashmere turtleneck. Style the overalls with an off the shoulder bodysuit either in a solid or a sparkly fabric. Tuck the hem of the overalls into a pair of glam heeled booties, causing the overalls to end up looking bloused out like joggers. Add big statement earrings. DIY your overalls! If you love sequins, consider sewing a strip down the sides like a tuxedo. Want a boho book? Embroider designs, sew on patches, sand some areas and fray a few holes and edges. Do a play on a tuxedo and style a pair of dark or black trim-fitting overalls with a white tailored shirt and a bow tie or ribbon tied in a bow at the throat. A pair of black lace-up boots or oxfords with a solid sole will complete the look. Watch out for looking too young. Pigtails and braids, glittery sneakers, baseball caps, quirky earrings and sunglasses, striped crew-neck t-shirts… things like this already read young and when paired with overalls the look can look like my ‘90s Halloween costume. Balance the volume. A more fitted top and a more substantial shoe will balance the bulk of a pair of overalls. Play with accessories. Necklaces can compete with the straps and hardware of overalls. Try bolder earrings, a bandana tied at your throat, a beret or beanie, a cuff bracelet. Use the advice above, mixing feminine or balancing the volume with the jewelry or accessories of your choice. Choose handbags wisely. A small purse will look even more tiny next to a pair of overalls. A larger shoulder bag or tote is a good choice that will balance well with the volume. If you prefer a crossbody, look for one with a slightly thicker strap so it doesn’t get lost in the fabric. Go hard or go home. Wearing overalls is a definite choice; you can’t wear overalls and think you’ll blend into the woodwork. 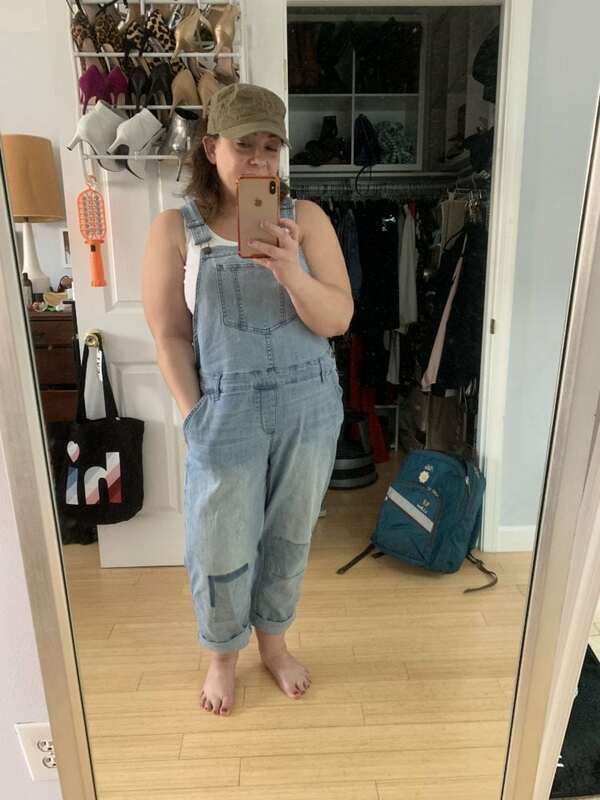 Expect to get comments, anywhere from you looking amazing to people wondering if you’re a farmer (yes, even when you’ve glammed up your overalls!). Own your look, rock your look, you have every right to wear it; the best accessory for a pair of overalls is confidence! For those curious about the overalls I am wearing in the photos above; the black overalls are from Universal Standard. The faded ones are from American Rag; they arrived in a Gwynnie Bee delivery and I paid to keep them; these are similar. The white overalls are from Gap; they are no longer available but these are similar. The dark denim overalls are from Carhartt; I got them at Amazon. And if you're looking for overalls for a guy in your life, the ones my husband has are from Dickies and we got them at Amazon as well. Awesome! My PayPal is wardrobeoxygen at gmail I appreciate it! Jackson, wow. You don’t seem like a very nice person. Are those real snakes? Who do they belong to? They are so pretty, especially the light colored one. I am happy that you are teaching your girl to appreciate them for the lovely, interesting animals that they are. It took me years to overcome the fear I inherited from my elders. They are! 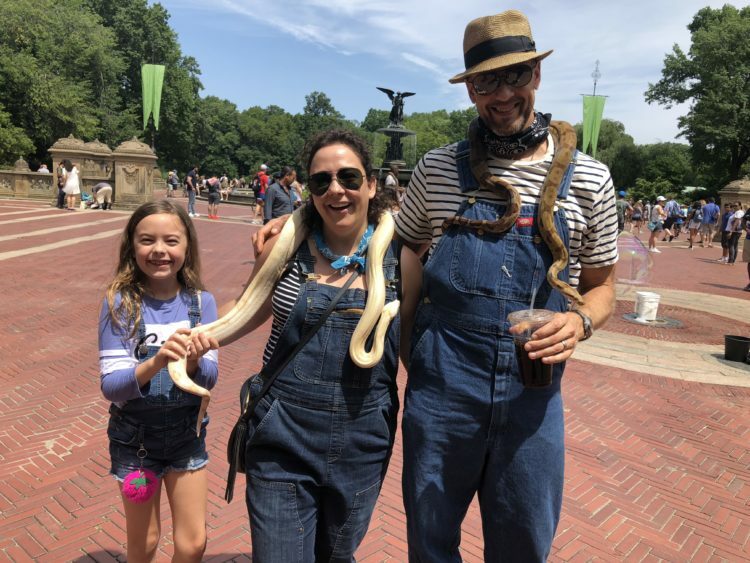 We were in Central Park and Emerson was so interested that we totally succumbed to their scam and paid to get the photo. She was always so afraid of them and to see her intrigued and willing to touch and wear it, I felt it was worth the money for the proof! Loved this post ! I own two pairs of overalls which I LOVE and always feel iffy when wearing them, considering if they look too juvenile. The all black was my fave. 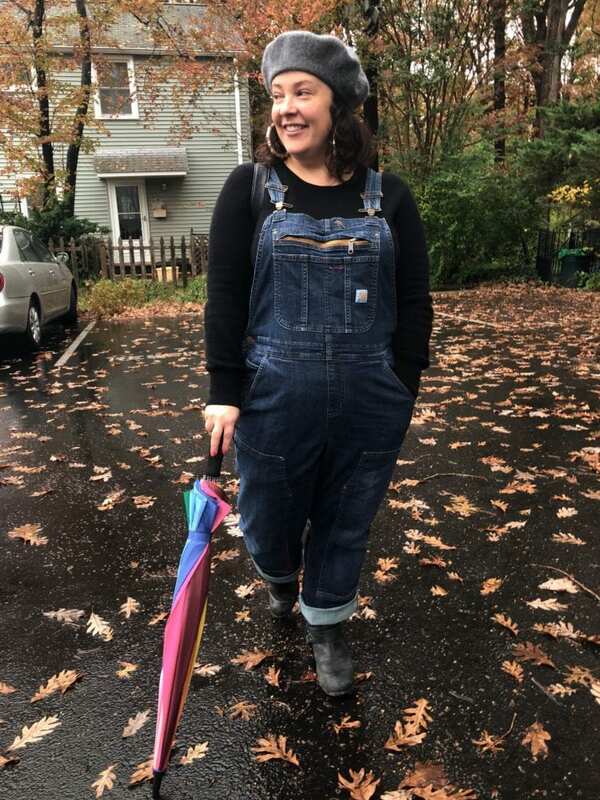 I know much of this post is about how not to look too young while wearing overalls -but- you look about 17 (in a good way)in the first photo of black overalls and beanie. If I could recapture my youth like that all I would ever wear would be overalls! What a timely post for me! I just received my new overalls from American Eagle ( https://www.ae.com/women-tomgirl-denim-overall-destroyed-light-wash/web/s-prod/0436_1263_916?cm=sUS-cUSD) but was pretty confused about how to actually wear them. 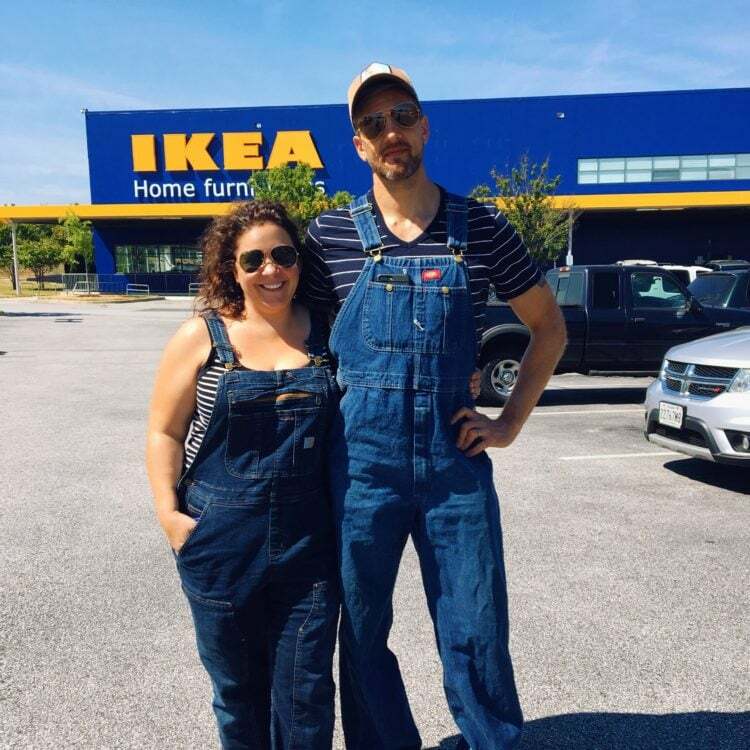 Great tips here, but I wonder about your thoughts on distressed overalls? Mine are quite distressed- I prefer that style for my casual lifestyle- but I don’t want to look like I am desperately trying to recapture my youth! Those are so cute! I’d totally do distressed overalls, I’d just add edgy accessories (or none!) so it feels tough and casual and not try-hard. Can we make more clothes that still love us if we eat a whole burrito bowl WITH chips and guac? !